Expected Value = EV ! The most important mathematical concept of poker is “Expected Value” most commonly known by its acronym EV. So what is EV and how can we use it to our advantage ? +EV means : You will win money in the long run. -EV means : You will lose money in the long run. Understanding that EV only effects the long-run is KEY ! The main difference between a winning and a losing poker player is that a losing player might win $1000 in a couple of weeks playing at the micro-stakes but he/she will most likely lose this money if they continue playing. A winning player might lose some money here and there but in the long run (monthly/yearly based) he/she will make profit. How to calculate EV ? A = How much money you can win. B = Your chance at winning in %. C = How much money you can lose. D = Your chance at losing in %. This may look a little complicated but trust me it is not. First things first. Let’s look at how math formulas work. In math you need to calculate the equations between the brackets first. So to calculate EV you first need to calculate A x B, followed by C x D, followed by subtracting the outcomes between each bracket. I will now show you the most basic example i can think of. Flipping a coin. If you flip a (fair) coin millions and millions of times it will always average out at 50% heads 50% tails. So if you bet 1$ on tails and you can win $1 if the coin lands on tails what is your EV ? First we need to calculate A*B because this is the equation between the first bracket of the EV formula. In the short run you can win 10x in row just as easily as you can lose 10x in a row. example : You flip a coin 10x and the outcome is 8x tails 2x heads. How ever if you keep flipping this coin millions of times it will always average out at 50% heads 50% tails. So how does this work in poker ? Before you can calculate your EV in poker you first need to know your equity. 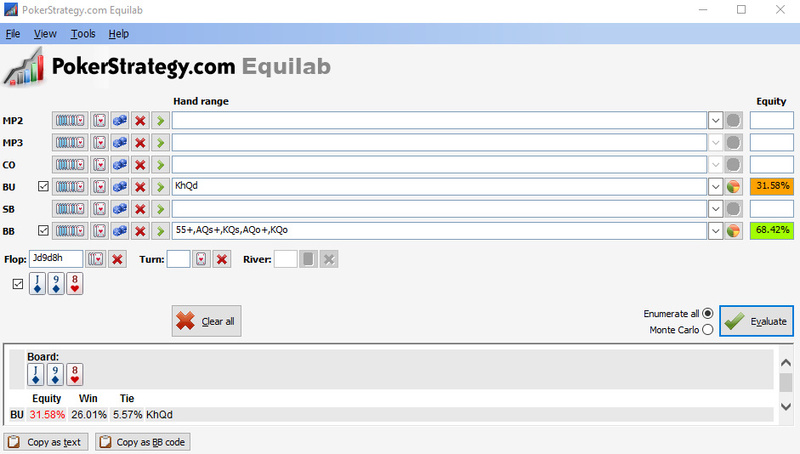 To calculate your equity i recommend you to use Equilab which is a free to download piece of software. This software is a MUST HAVE for every online poker player. 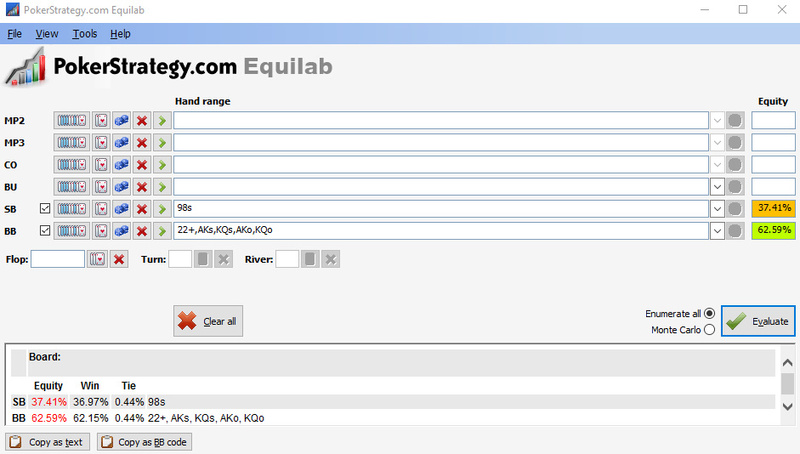 Important to know : Using poker calculating software like Equilab is done after your done playing to help you analyse your hands/play as you almost never have the time to use this software in real time while playing. Example 1 : You are playing heads-up (No Limit Texas Hold’m CashGame) against an opponent that just pushed all in pre-flop. The buy in at this cashgame = $5.00 and this is both your and your opponents first hand to play. You are holding pocket aces (Ace-Spades & A-Harts). Even though this is your first hand of the game you know this player well enough that he only goes all in pre-flop if his range of hands = AA – KK – QQ – AK(s) – JJ. We can now use the basic EV formula to see if we can expect to make money from calling this $5 all in , in the long run. Now that we know our equity we can use it to calculate our EV. Looking at this example from an equity stand point you should always call as you will win on average 8 out of 10 times and only lose 2 out of 10 times. However the call to make is $5 to expect to win $3.00 in the long run. Example 2 : It’s the same situation as example 1, same game, same stakes, and again an all in pre-flop from our opponent. Except that this time we widen our opponents range of hands to all pocket pairs + AK + AKs + KQ +KQs. And this time we are holding 8-9s (8 + 9 suited) instead of pocket aces. First we need to know our equity again. We will therefor start by importing our hand + our opponents range of hands in Equilab. As you can see we this time only have a (rougly) 40% equity. I would personally always recommend to fold suited connectors to every pre-flop all in. But lets proof this by calculating our EV. Our expected value in this spot is to lose $1 by calling $5 every time (in the long run) Therefor it should be obvious that this is an easy fold situation. Both example 1 & 2 are pre-flop examples with no money in the pot except the blinds. I will now show you a more complicated situation post-flop with a larger pot. When calculating EV it is very important to understand that the POT(the full amount of money already on the table) is not yours ! It only belongs to the player who claims it at the end. It doesn’t matter how much money you put in the pot the pot is only yours if you win the hand or claim it by making every opponent fold ! Example 3 : You are playing a 6 max No Limit Hold’m CashGame with a $5 buy-in and the blinds at $0.02SB & $0.05BB. You are on the button and everyone folds to you. Your hand = K(harts)Q(diamond) and you make a raise to $0.15 (in an attempt to steal both the blinds) The SB folds and the BB makes the call. The flop comes J(diamond) 9(diamond) 8(harts). At this point your hand is good since you have both a back door straight and backdoor flush draw. However your hand is not great. The only way to make a decent straight is to hit a 10 on the turn and river and even if 2 more diamonds come you will only have a queen high flush(Your opponent can easily have the K or A of diamonds giving him the better flush. So you decide to just check it. The BB thinks for a little while and makes a $0.20 raise (4BB raise). At this point it’s a good idea to calculate your EV to see if calling this raise would be profitable. We will do this in 3 simple steps. Step 1 : We need to know how much money is already in the pot. Step 2 : We need to place our opponent on a range of possible hands he can have + we need to use this range to calculate out equity. We can now import all of this information (Your starting hand + Your opponents range of hands + the flop) in Equilab. Step 3 : You can now calculate EV. At this point making the call is profitable but you will be risking 4BB to win less then 1BB. But let’s continue this hand with 2 different outcomes. Is your EV still +EV ? Well let’s calculate. In this outcome your hands equity has improved nearly 20% and your new EV is not only +EV it is also nearly equal to the amount you need to make the call. Therefore calling in this spot is a must ! In this outcome your EV = -EV and you should fold your hand. Calling and or bluffing in this spot (against this opponents range of hands) is a bad move and you will always lose money in the long run. I hope that you now understand how to apply the basic EV formula in poker. Being able to calculate EV is not difficult. But it does take some decent amount of time , patience & practice. By using software like Equilab of the table (after you are done playing your session) you will be able to learn how to use EV situations in real game play. Rome wasn’t build in one day and you will certainly not be able to perfectly calculate your EV in every hand/ every spot in one day. IT TAKES TIME AND A LOT OF PRACTICE !